Smoked Turkey | Smoking Meat Forums - The Best Barbecue Discussion Forum On Earth! Discussion in 'Pellet Smokers' started by Rmartinez2, Mar 5, 2019. Hey everyone today i'll be putting a small turkey in a brine to smoke for tomorrow. I had a couple of questions on the cook, specifically the placement. I have a resting rack that sits on a cookie sheet/pan. Would it take away from the smoke if i were to put the turkey in the grill on that? Ultimately my thoughts are that i would be able to catch the drippings in the cookie sheet thus making cleanup easier as well as using some for a gravy. thoughts? Any other tips fully welcome as well. It might reduce the smoke a bit. I use one of those v-racks that hold the bird up several inches above the lip of the pan and allows smoke to circulate under the bird. It's always a last minute decision for me, whether to roast in a pan or put directly on the grill. Cleanup isn't a problems either way, but if you want drippings for gravy you don't have much choice. You can smoke it to an IT of 140° and then pan it after that. This way you'll get smoke circulation in the beginning and then still get plenty of drippings for gravy. If you want to do it simply for cleaning purposes, the yeah just pan it. You'll get a little less circulation and this a little less smoke penetration, but it'll still be smoked. Rmartinez2 and retfr8flyr like this. sometimes you read some really logical stuff like this... and you think, "wow did i really ask what i asked?" This makes perfect sense man. I appreciate it. What Preacher man said, also remember that poultry is a real sponge for smoke, a little goes a long way. Lot's of guys over smoke their poultry and then complain they don't like smoked poultry. 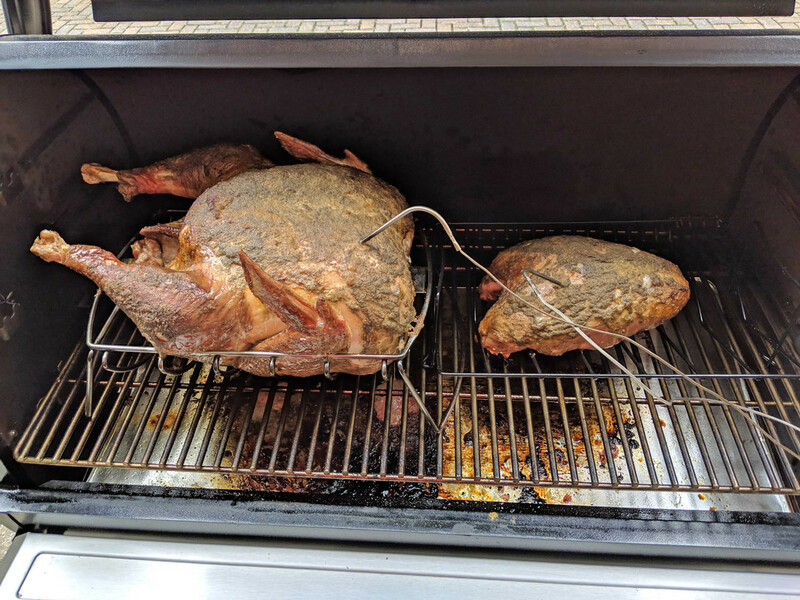 I wouldn't use any smoke mode with the turkey, I would just run it at 225°, cherry pellets give a nice flavor and great color, for about 2 hrs, or until you get to around 140° internally and then put you pan under it and crank it up to about 375° ,until you reach 165° in the breast and 175° in the thighs. Sounds good! I'll be trying this out hopefully tomorrow if i can get home with enough hours in the day. Thanks again everyone. There you go some great ideas when's supper? Didn't take long for my 1st. bird to vanish, good luck. Flatbroke Thanks for the like. Here is a shot of my Christmas birds. These were an 18lb turkey and an 8lg breast. This was about taken about 3/4 way through the cook/ I didn't use anything under them because we were also cooking a 25lb turkey inside in the oven and were making gravy from that bird. Great looking bird, you done good.